Osteosarcomas are uncommon tumors that affect mainly children and adolescents. Statistics Canada estimates that 153 cases per year are diagnosed in Canadians 0–19 years old . Survival has been dramatically improved through the routine use of neoadjuvant and adjuvant multidrug chemotherapy. Once multimodality therapy has been completed, surveillance commences. 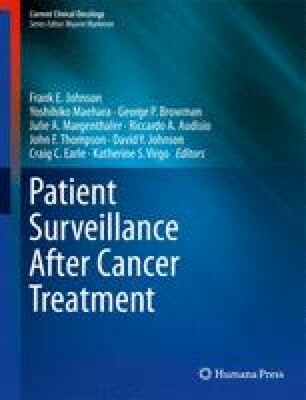 The goals of a surveillance program are multifactorial and include assessment of the primary tumor site for recurrence, assessment of functionality, especially when limb-sparing surgery has been employed, early detection of systemic (particularly pulmonary) metastases, and detection of treatment toxicities. Screening is defined by the National Cancer Institute as checking for disease when there are no symptoms. Since screening may find diseases at an early stage, it is hypothesized that this could improve chances for cure . As a test for the presence or absence of a disease , screening can occur either prior to the detection of a disease (primary screening) or after a disease has been diagnosed and treated (secondary). A screening program should be effective in detecting potentially curable disease, be cost-effective, and available to patients.